Admire long silver pipes measuring 42 feet long and suspending 54 feet from the ground. A small, intimate, avant garde, experimental, regional theatre offering a wonderful mix of old and new drama. 7th St. and Hayes Ave.
Eastern Illinois University campus, the new Doudna Fine Arts Center gives EIU Theatre Arts students, faculty and patrons the best that contemporary theatre design can offer, including The Theatre with a proscenium stage, the flexible Black Box studio and the Movement Studio. EIU productions and visiting troupes for all ages are featured. founded in 1895, Eastern Illinois University provides an array of entertainment from collegiate sports to symphony and theatre performances. Visitors can enjoy a playground, picnic area with grills, trails, fishing pier and gazebo, and boating. Visit this family fun center, featuring an Olympic size pool, a zero-entry pool with large splash toys, a 121-foot waterslide, diving board, large umbrellas, deck chairs, and concessions. Open year round, this arts haven houses art exhibitions and permanent collections, a gift shop, special events, performing arts and educational programs. 8 miles south of Charleston, Lincoln’s father, Thomas Lincoln and step-mother, Sarah Bush Lincoln, along with many Civil War veterans are buried here near a beautiful old brick country church. The Embarras River Near Greenup was the site of a covered bridge built by Abe and Thomas Lincoln and Dennis Hanks. The original bridge was 200 feet long. Reconstruction of the bridge began in 1998 and was dedicated in 2000. The covered bridge is on Cumberland Road just West of Greenup, between Rt. 40 and Interstate 70 in Cumberland County. A.K.A the Jackson Cover Bridge. A huge selection of genealogy information at the old Johnson building with a Victorian room upstairs. Don’t miss the original train depot located next door. In 2010 a new Military Museum was opened located in the old Carnegie library across the street. A converted Carnegie Library pays tribute to local veterans from the Mexican War to the current conflicts in the Middle East. The building itself has served the Terre Haute and Vandalia Railroad, the Pennsylvania, the Penn-Central and Illinois Central Railroad. Now a museum preserving artifacts from both railroading and telegraph history. Halfway between Greenup & Casey just South on 2150 East from US 40. DNR riding facility – 220 Acre of Motorcycle and ATV riding area. Approximately 25 miles trails, natural terrain Motocross course along with a pee-wee track for the little ones. Pay per use of the facility or you can become a member of LTM, it’s like having your own 220 acres of trails in your backyard to ride when you like. Approximately 30 motocross events per year. 402 S Lincoln Highway Rd. The Manly – McCann House, built in 1838, is now the Clark County Museum. Uri Manley was a learned lawyer from Kentucky who came to Illinois in 1837. He was appointed as the first postmaster of Marshall in 1838 and had an office in this home. Today, the museum houses information on the Lincoln/Douglas debates, unique county architecture and more. Built in 1871 as a livery stable, Harlan Hall’s second floor later served as an opera house. The Second Floor serves as a National Road Welcome Center. Enjoy dioramas that depict the evolution of the road. Talking mannequins share tales of the road as well. 2,600 acres of land and 811 acres of water, with 39 miles of shoreline. Since opening in 1982, the park has continued to develop. Visitors can enjoy picnic areas around the lake, a 139-site campground with shower facilities and a playground, 15 miles of horse trails, courtesy dock facilities, fuel dispensing, cabins and boat rentals. Constructed in 1831, was brought down the Wabash River by barge, hauled by wagon & cut to fit without mortar. It is still used daily, as the National Road runs over the bridge. The Lincoln School Museum is a restored 1880’s one-room brick school. It stands at its original location, and has been restored to its turn of the century charm strictly through private donations. The building now serves as a living history museum for area students, and represents the typical education available at the time of its existence. It is open to the public on weekends from June through August and anytime by appointment. 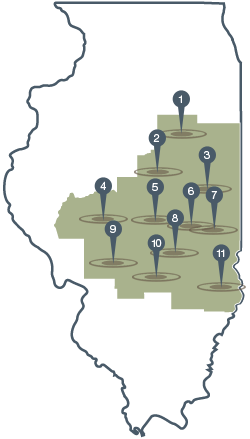 The City of Mattoon is ideally located in central Illinois just 2.5 hours from Chicago, St. Louis and Indianapolis. Our world class sporting facilities, parks and lakes have made Mattoon adestination for a number of events. Each year the city welcomes thousands of participants for youth sports tournaments including softball, baseball, soccer, track and field and more. Youth aren’t the only ones to compete in Mattoon, adult athletes compete in marathons, triathlons and sailing events. Located in beautiful Peterson Park, the Peterson House serves as the Mattoon Welcome Center offering free publications for visitors. 1718 Broadway Avenue, originally built in 1918 by the Illinois Central Railroad and recentlyremodeled in 2011. Station continues to be an active Amtrak Station. Over more than 65 acres of agricultural land have been transformed into natural habitats characteristic of east central Illinois. Miles of groomed trails wind throughout prairie, forest, and wetland habitats. The center also provides environmental education programs to public and private groups. Fed by the Little Wabash River and has an average depth of only 10.5 feet. The lake is a popular recreation spot for fishing,camping and boating, with approximately 1,250 boat permits issued on the lake every year. Camper lots, tent sites and dock rentals are available. Fun for the whole family! 1.2 million gallons of water, over 30,000 square foot pool play area, zero depth entry, waterslides, lap swimming, water play structures, 100’s of lounge chairs, multiple shade areas, and more. Very clean facility and friendly staff. Dr. Rutherford left an undeniable mark on local, state and national history as a friend of Abraham Lincoln, as a champion of human rights in the Matson slave trial, and as a civic-minded leader in his community. The Landmarks Complex has grown to include several sites of historical significance, including Dr. Rutherford’s home and office, Mail Pouch Barn, Pennsylvania Depot, meeting house and more. Open 10am-2pm on Fridays and Saturdays, April 1 through October 31. Tours also available by appointment. consists of three main buildings: the Dealership, the Toy Room and the Main Museum. The Main Museum building has over 80 AC tractors from the early 1900s. In addition there are two other barns with nearly 100 Allis Chalmers implements. Visitors are welcome anytime, but it is best to call for appointment. A non-profit organization that offers a full range of art activities and programs to the residents and artists of the region. These include exhibitions, classes and workshops, tours to other art centers and events, community outreach programs, and scholarships for talented youth. The courthouse was built in 1891 of native limestone, and is the county’s third court building. With its Romanesque architecture and its four-faced clock tower, topped by a statue of Justice, it is listed today on the National Register of Historic Places. Inside, original murals depicting a scene from Shakespeare’s ‘Merchant of Venice’ and a view of the Chicago Exposition are fully restored. Compare pioneer and Victorian lifestyles when you visit the log cabin and brick Italianate home. View the desk and chair used by Abraham Lincoln when he visited Paris while traveling his court circuit. Donations welcome. Opposite the Art Center, an extensively landscaped sunken garden, featuring a serpentine brick wall from Thomas Jefferson’s design at Charlottesville, and a Lions’ Head fountain duplicating original park features in France.